The Central plains area is the area around Bangkok. 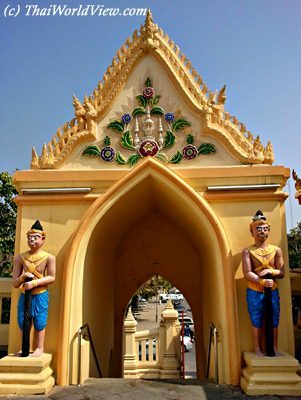 Nakhon Pathom is a big city 50 kilometres West of Bangkok. 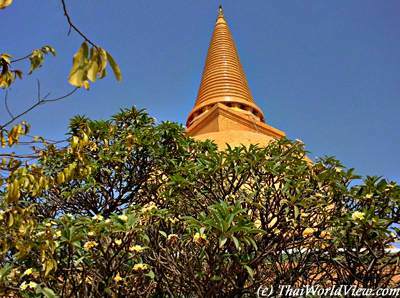 Phra Pathom Chedi (พระปฐมเจดีย์) is 120 metres high. 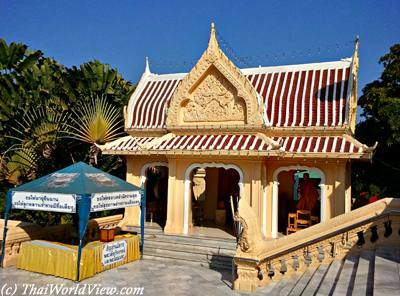 It is the oldest and highest Buddhist pagoda in Thailand. 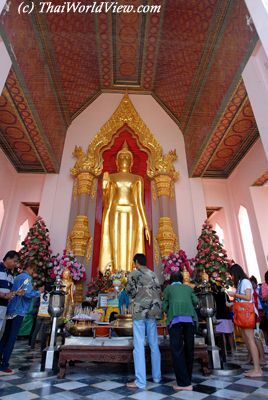 It contains Buddha relics. 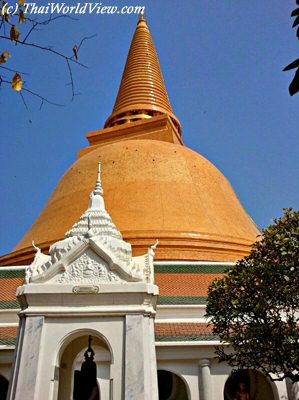 Renovation is ongoing since year 2010 at Phra Pathom Chedi. The high pagoda renovation is completed. Now surrounding gallery with Buddha statues is ongoing. All floor piles made of old stone are also replaced. 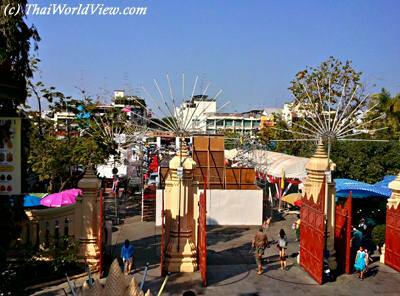 Phra Pathom Chedi Annual fair happens in month of November or December as it is linked to the twelfth lunar month. There is a big market near Phra Pathom Chedi. There is a few restaurants famous for its delicious red pork on rice (ข้าวหมูแดง). 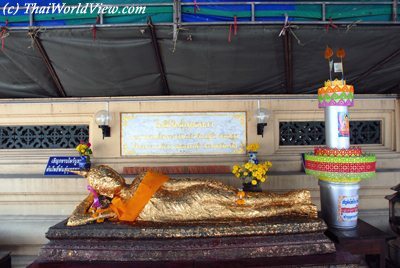 Reclining Buddha at Phra Pathom Chedi situated in the gallery around the sacred pagoda. 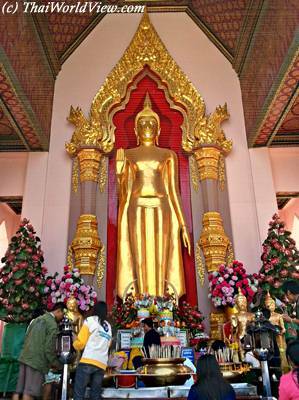 It is said that Buddhism was first introduced in Thailand during 3rd century BC in Nakhon Pathom. The original pagoda was 84m high. 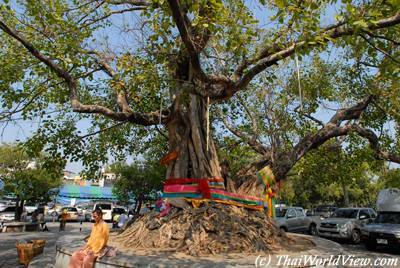 King Rama IV, still as a monk, made a pilgrimage in 19th century here. Once becoming King of Thailand, he decided to restore the pagoda and to cover it with a new one. 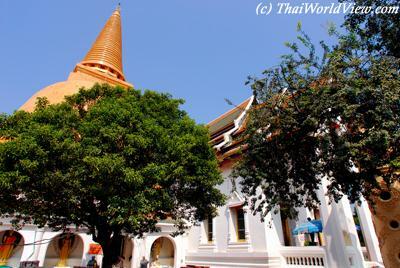 There is a big area around Phra Pathom Chedi. It is used for fair and also as a parking. 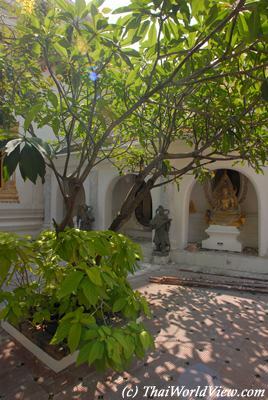 The gallery surrounding the Phra Pathom Chedi includes many Buddha statues in various positions. 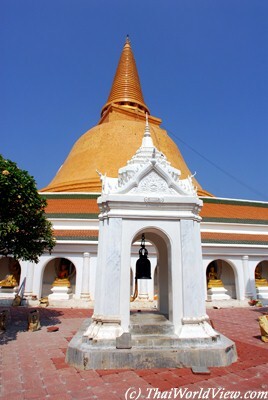 In year 2011 the Thai Culture Ministry had a plan to seek World Heritage status for the sacred Phra Pathom Chedi pagoda. 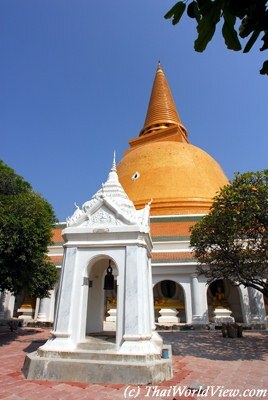 The access to Phra Pathom Chedi is free but very strangely there is a booth selling tickets for tourists. It is not compulsory.